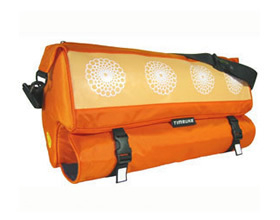 For the yogi on the go, we couldn't find a better choice than this bag by Timbuk2. It's sturdy, compact, stylish, and fun. It comes with a detachable padded shoulder strap and an easy-access pouch for a water bottle. The mat buckles to the outside of the bag, leaving plenty of room inside. There's a large inner pouch plus four small pockets for essentials like your keys, wallet, and cell phone. One zipper pocket is perfect for file folders and papers. - Check out Yoga Journal for a full read.